This is primarily for Christopher Dahle in Colorado but also it’s a hello for Tom Bockman. Tom I’m glad you are in the schools so the youngsters can get the benefits of your wonderful skills, but I suspect you could do quite well writing for one of the woodworking magazines that are out there. Anyway by way of introduction, to others, I’m Bob Itnyre. Woodshop teacher in 29 Palms and Yucca Valley CA. Most of my career I taught Jr High woodworking and then my last four years I taught High School woodworking. I retired last June. I’m 72 and it was time. Christopher, I am delighted that woodworking is making a comeback in your district. I think that educators are finding that the craft skills are really important, and even though craft skills are not tested on all these standardized tests they are now giving, Woodshop (for example) causes many students to come to school and thus they get to their other classes too. Additionally, they get as asides a lot of Math and I used to push some history too as in stories on the construction of Viking ships or nails found in England from the Roman occupation, or on selection of wood for the English longbow. I have former students who are now Plumbers, Heating and Air conditioning repairmen and a Farrier too, not to mention many who work in the construction trades. Every so often I run into a former student and so far every single one of them still has a project that they built in my class, or their mother has it. How many still have a term paper from English or History? For Christopher, I have a brunch of plans for woodworking projects which I’ll be glad to mail to you at your school. I also have a small stool which I’ll put in there too. This stool was always a hit, especially with the Moms and Dads. Remember when mom says to the 12 year old, “get little brother or sister and wash their hands for dinner.” This stool is great for the little one to stand on while getting their hands washed. You asked about projects. I pushed the tape measure. The reason was because many of my contractor friends were dismayed at the number of prospective employees who could not read a tape measure. I used to get a 12 inch piece of furring strip and then have the students cut it to 5 or 6 shorter specified lengths and then stop at four inches in length. They had to do these cuts on the HAND powered miter saw. Lots of complaining because they all want to use power saws. Not yet. If they got the cuts correct then they would use the metal stencils and stamp their name and the year in the block and then sand off the corners and edges and it would be their sanding block. If you can, get tape measures with the Metric system on the other edge of the tape. Great place to get them conversant in the Metric system. Anyway, if you send me the address of your school. I’ll get these plans and the stool in the mail. Where is Occam's razor when we need it? I went by my classroom yesterday to see what work had been done to it over the summer. The district maintenance men were working on another classroom. They had huge pallets that wall material had been shipped in. The pallets were all 2x4 and 1x6 pine, stapled and spiral nailed together. I'd class it as #3 or some even #2. They were going to dispose of these pallets. They said I could have them. I did not waste time trying to pull the spiral nails or the staples. I just set my skil saw for a hair over 3/4 and cut out the 1x6 pieces. I got a huge number of pieces. I'll have the students cut them into squares roughly 5 3/8 square and then glue them up into turning blocks for the lathe. Granted I'd like walnut or maple better, but you can't beat the price. Edit. Here is the photo. Tom (see just above)has been very graciously helping me with putting photos on these messages. Thank you Tom. 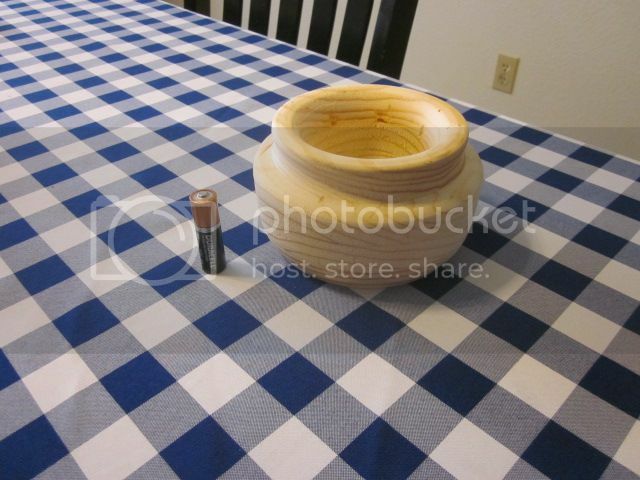 I took four 5 3/8 squares of this 1 x 6 pallet material glued it together and then turned this bowl. The kids like doing this and so do their parents when they take them home. I put the AA battery in there for scale. Now I have to work on my cropping. Have any of you seen this site? I just got back from the AWFS show in Las Vegas. I try to get to it every two years just to see what’s new. I think it is a bit smaller this year than two years ago. Some of the things that were of interest to me follow. There is a student woodworking competition that is called “Fresh Wood.” As they say in their brochure it is for serious woodworking students. There were about 40 entries on display and they all were absolutely beautiful. I was particularly drawn to a two necked guitar that was wonderfully beautiful as well as an engineering marvel. It had a total of 18 strings on it and the tension must have been huge. I stopped at the Woodcraft booth which is the company that sponsors this web site and talked to a person named Gary. Turns out he and I had both been in the Marine Corps a few years back and served at 29 Palms. Usually I see Grizzly there but I did not see them this year. I also did not see Delta. I did not see Oneway chuck company either. One of the booths I walked past had the familiar Orange coloring of the Adjustable clamp company. It was labeled Pony which has often been on the various Adjustable products. I talked to the man at the booth and he told me that Adjustable was no more, and hence forth it would be the Pony Company. I guess they will still make clamps. Something I’ve always wondered about so I thought I’d ask was, who was Jorgensen? If you have any Hand Screws from Adjustable you’ll see the name Jorgensen written on them. The Pony man told me that Hans Jorgensen was a Swedish carpenter who lived around 1900 and that he made some improvements to the old fashioned wooden hand screw clamps that allowed them to have un-parallel jaws. He went on to say that Jorgensen let/sold/allowed the Adjustable clamp company to make and market his invention and that they put his name on them. Probably there is more to the story. Does anyone have any more information on Hans Jorgensen? The story of Jorgensen and Adjustable sounds sort of like the one about Leonard Bailey and the Stanley Plane company. Lots of history in these tools we use. Some of the booths are little tiny companies that have an idea and want to expose it to the industry. One little booth had a product that is a piece of graphite (as in pencil lead) that is shaped like a box cutter blade. It is used to make very accurate marks on you projects. Just take out the metal blade and replace it with this blade shaped piece of graphite. I can think of some problems but since I have not yet used it I’ll reserve judgment until I do use it. I must have some confidence in it because I bought two dispensers of it. Met a gentleman from New England that had an interesting looking clamp with sharp points on it that are for clamping miter joints while you pin them or just wait for the glue to dry. Bought two of those. Stopped at the titebond glue place and suggested they sell extra lids. I get a lot of lids that get dried glue in them and can’t be used until I get the dried up, plugged up, glue out. You only get so many of these cycles of clean out until the lid breaks and is useless. No sure if they will do anything or not. In case you’re not familiar with the AWFS shows they have them every two years in Las Vegas and every two opposite years in Atlanta. They’re fun, fascinating and you meet some wonderful people there. I recommend it. This is a later comment, but I re-read these postings every so often because there often is a grain of knowledge, or a place for comment, that I miss the first time around. This comment concerns diversity. We all know that the reigning zeitgeist holds that diversity is good and more diversity is better. OK, that's all well and good but how about the diversity of ability and interest? Many of our students are not interested in college, and are anxious to get out of high school and get to a job/career. For these students their niche of diversity does not include becoming a philosopher or brain surgeon. They love construction or plumbing or maybe even laying bricks. I have a number of former students who are plumbers, heating and air conditioning mechanics, and even a blacksmith. He is actually a ferrier and he told me so. My point is diversity is not being observed when we fail to offer classes to students who are vocationally oriented. By the way these students I just mentioned are very busy, earn excellent pay, and are welcomed with open arms by the homeowner who need their services. I suspect I'm preaching to the choir but I worry. A nation probably takes 3 or 4 generations (maybe more) to become a first rate technically proficient society and it can all be lost in one generation if the youngsters are not learning craft skills from their elders. By the way when one of these elders dies a lot of knowledge dies too. Have any of you ever seen this website? I have two bandsaws. One is a Delta 10 inch and the second is a 14 inch Asian import. I used a depth micrometer and the lip on the first one was .096 inches below the surface of the table. The lip on the second one was .114 inches below the surface of the table. Both saws were used when I got them. Both had badly dinged up, but useable inserts. A few years ago I got a packet of yellow plastic inserts. I was not happy with them because the lip was too thick and the insert was higher than the table. I now make my own out of wood and I notch and glue in a small piece of wood to go in the saw slot to keep the insert from rotating. Seems to work fine. Hope this helps.